The other day Canada's Prime Minister Stephen Harper spoke at Israel's parliament. Rarely does Israel hear such an impassioned, pro-Israel speech on the floor of the Knesset, let alone from the leader of a foreign country. The first speech in the Knesset by a Canadian prime minister was peppered with standing ovations, the enthusiastic likes of which may not have been seen since Prime Minister Binyamin Netanyahu addressed the US Congress in 2011. Statements like “through fire and water, Canada will stand with you” were met with rousing rounds of applause, and though clapping is against Knesset protocol, even Speaker Yuli Edelstein joined in. The Canadian premier said he believes “it is right to support Israel because, after generations of persecution, the Jewish people deserve their own homeland and deserve to live safely and peacefully in that homeland. Unable to control himself at such a passionate outpouring of Zionist ethos, MK Ahmed Tibi from the Ra'am (United Arab List) - Ta'al party interrupted Harper's speech spewing protected-freedom-of-speech lies: Israel's is an apartheid state and the like...culminating that his fellow Arab MK, Taleb Abu Arar doesn't even have water or electricity in his village. Its unfortunate that the world takes every word from MK Tibi's mouth as sacred. 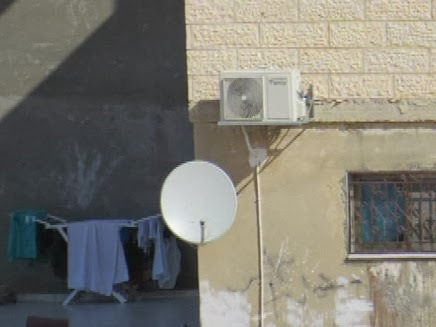 Not only does MK Taleb Abu Arar's village (and personal home) have water, sewage, electricity, gas delivery, garbage removal, telephone/high speed internet infrastructure and free State sponsored education, but MK Taleb Abu Arar's impoverished and apartheid home also has Satellite TV. Here's an easy tip to know when MK Dr. Ahmed Tibi is lying. One of the more intriguing aspects of the ongoing coerced negotiations between Israel and the Palestinian Authority is the issue of "land swaps." Since Tzippy Livni has accepted the notion that Israel captured the "West Bank" from the "Palestinians" in 1967, therefore Israel is required to part with 100% of the land area. Livni's largess towards the settlers provides for 3 or 4 settlement ghetto-blocs and in return, Israel will have to part with the equivalent land mass from pre-1967 Israel to placate the Palestinian Authority. The intrigue revolves around an idea that to further the "2 States for 2 People" idea, and to keep Israel "Jewish and Democratic" (Livni and the USA's principles), that there must be a division of Israel's Jewish population and the "Palestinian Arab" population for their to be peace -- and to resolve the issue, there must be a (Jew-free) "Palestinian State." Yesterday, the idea was leaked to the press that the land swaps could include the "Triangle" area within pre-1967 Israel which is predominantly comprised of Israeli Arabs (or as Israeli MK Ahmed Tibi prefers to call himself, a Palestinian Arab). The borders would be redrawn and hundreds of thousands of Israeli Arabs would change their citizenship status -- and become citizens of the Palestinian Authority. This would be a great idea for many reasons. 1. Currently, the Israeli Arab political parties, such as anti-Zionist Raam Taal party, do no want to see a "Jewish State" of Israel; they want Israel to be a "State of all its citizens" with no Jewish character at all. If they are already at odds with Israel as a "Jewish" State, they can be part of the "2 State solution" and live in the second state they so fervently advocate. MK Tibi was Arafat's chief adviser, MK Hanin Zuabi was a on the Marmara terror ship to Gaza, and none of the Israeli Arab MKs signed the petition calling for Jonathan Pollard's release. The Arab political parties simply have no common denominator with the rest of Israel. 2. The larger the areas of the Israeli Arab regions / Triangle given to the Palestinian Authority -- the larger the settlement blocs could be, thereby reducing the painful Livni plan of throwing tens of thousands of Jews out of their homes. 3. The reduction of Israel's overall population would free-up huge monthly payouts from Israel's social security as well as reduce the burden on Israel's medical services and HMOs. 4. Israel would actually become "more Jewish and Democratic" (Livni's mantra). 5. Not one Israeli Arab would be relocated or transferred or thrown out of their home. Rather their nationality would change to the one they already associate with. 6. And now the real reason I favor the idea: Not one Israeli Arab in their right mind would want to be part of the Palestinian Authority instead of being a citizen of the State of Israel -- every single Israeli Arab will vote AGAINST the plan in the "national referendum." MK Tibi has gone insane against the plan which is exactly the reason I will fully support it. Unfortunately, the USA and Livni will most probably leave out the land swaps idea with Israei Arab citizens because they want their plan to pass the national referendum....exposing Livni's hypocricy to all; the "peace" deal has absolutely nothing to do with securing Israel's future as "Jewish and Democratic."